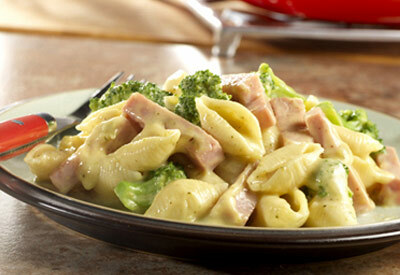 A mustard-spiked cheese sauce cloaks ham and broccoli, and is stirred into pasta. It's a recipe for a quick-cooking family favorite! Heat the soup, milk, mustard and broccoli in a 10- inch skillet over medium-high heat to a boil. Reduce the heat to low. Cook for 5 minutes or until the broccoli is tender. Stir the ham and pasta in the skillet and cook until the mixture is hot and bubbling.